ChiIL Mama : More Winners Updates: Mindy Hester & Joanie Leeds TODAY! More Winners Updates: Mindy Hester & Joanie Leeds TODAY! Chicagoland IS Kindie Land this weekend!! We've given away all our 4 packs and pairs of tickets, but you can still get out and see a bunch of great family friendly live music and theatre. Here's the short list of ChiIL Mama's favs, with links to more info. 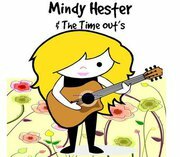 Kindi Concerts/Live Music: Mindy Hester-Wilmette Theatre 10am-(birth-10 with parents) Jackie B. is our 4 ticket winner. Click the link for all the details. Kindi Concerts/Live Music: Joanie Leeds-Beat Kitchen Concerts for Kids-noon-(birth-10 with parents) *We have a winner unable to go, so a new winner was picked-Erika S.
Check out Joanie Leeds while she's in Chi-Town from NYC. Let's give her a big Windy Kindie welcome!! Here at ChiIL Mama, we've reviewed and given away multiple copies of both of her CDs before. Now we're super stoked to see her live. Come on out to Beat Kitchen and hear her, meet us, and grab a shiny, new, holographic ChiIL Mama button-FREE. It was 60 degrees in NYC yesterday. What? Isn't it supposed to be snowing right about now? I just heard our very own Groundhog, Staten Island Chuck didn't see it's shadow today which means we are in for a short winter. But if I've learned one thing in life, it's to be wary in trusting a hog from Staten Island. OK, I know there's a song in there somewhere. To all my new little Nightlights joining us from LA, Boston and Westchester, welcome and thanks so much for coming out to see our January concerts. We had a blast playing for you. Come out for my first show in the Bay Area in honor of Bicycle Safety week! To find out about upcoming concerts, make sure to check my website or become a Facebook Fan to get all the news & invitations. Many of my tunes from 'What A Zoo' and 'I'm A Rock Star' have been playing on various radio stations across the country. Some of em' have even made their way to becoming #1. To keep them playing, make sure to make your requests known. XM Sirius Sattelite Radio takes requests right on their Kids Place Live Facebook wall and many others you can call in and request a song. With Valentine's Day approaching, feel free to suggest one of my lovey dovey tunes like, 'Give Me A Hug. Thanks everyone! Bluegrass in Berwyn at FitzGerald's- 1pm (adults $12/kids just $2-all ages) 5th Annual After Brunch Bash at FitzGeralds with Sunnyside Up and The Teflons! Click the link for our prior write up with all the details. 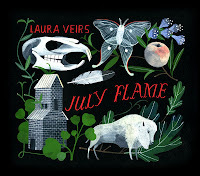 Tumble Bee, the first children’s record from the prolific Laura Veirs (whose last release, July Flame, was dubbed “a perfect Sunday afternoon record” by The Oxford American and “sweet and irresistible” by Rolling Stone) inspires listeners to lean in close and hit replay. The youthful innocence in Veirs’ voice lends itself well to the jaunty spirit of the album. The recording covers a wide range of folk songs, from early 20th century work songs to the ballads of Jimmie Rodgers, Woody Guthrie, Peggy Seeger and Harry Belafonte. Inspired by the birth of her son and by countless fans who’ve told her over the years how much their kids love her records, Veirs became curious about the history of American children’s music. She and Martine listened to hundreds of songs from the past several centuries, including Harry Smith’s famous Anthology of American Folk Music. They selected what Veirs calls, “a sampling that reflects our richness as a people.” Tumble Bee was recorded at home in the spring of 2011. She put out her own self-titled album Laura Veirs, recorded live and featuring just her and guitar, in 1999. She has since made seven highly acclaimed records with producer/husband Tucker Martine. Veirs’ seventh album, July Flame, was released in January 2010 on her own record label, Raven Marching Band Records. 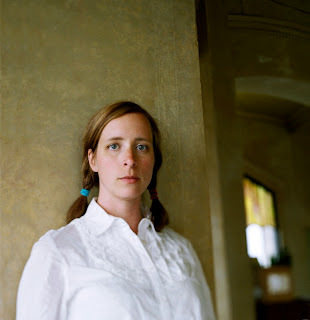 Her most recent album, “Tumble Bee: Laura Veirs Sings Folk Songs for Children,” was released in November, 2011 to rave reviews both in the mainstream and parenting press. Veirs tours frequently in Europe and North America and is currently writing songs for a new album. She lives in Portland, Oregon with Martine and their young son Tennessee. Click the link above for ChiIL Mama's show photos and review. Magic, music, puppets, and performance unite in this awesome conglomeration, worthy of the escape artist/magic master himself. 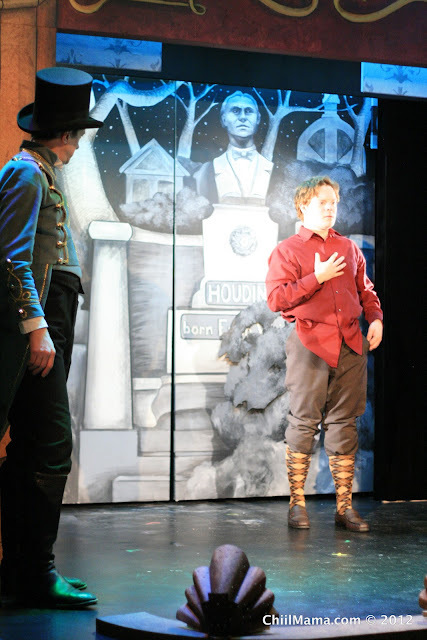 The Houdini Box is based on a book by Brian Selznick. Did you know, he's also the author of Hugo Cabret-the now famous book that inspired the movie Hugo, nominated for 11 Oscars? This show is a delight for all ages. Show times are 11am and 2pm every Saturday and Sunday. Check the main site for additional weekday shows and more. Full show details, tickets, interviews, are at Chicago Children's Theatre's main site right here.